Airtel Nigeria is Here again with its Amazing Unlimited Data. It's of course a free browsing for Airtel to get unlimited data on just one sim. 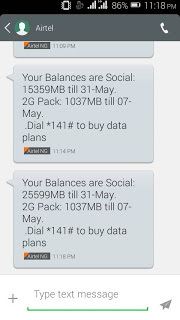 Airtel social plan seems to leak and almost all Nigerians are tapping from the source but nobody is able to use it except media like Facebook and others are powered. In this tutorial, you will be able to activate the data and power your whole device for surfing, streaming and downloading. Now, let's go! 1. This is so easy and simple. Just dial *317# and you will be automatically opted to SmartTRYBE Tariff. 2. After a successful migration, just dial *688*1# to activate free 1GB of Social Data Bundle. 3. So keep dialing *688*1# to accumulate your data to any amount of data you wish to have. 4. You can dial *140# to check your data balance. 1. Just download the latest version of Opera Handler (search on Google). 2. Then go to the file you want to download and copy the source download link or url, go to ww w.roogen.com and scroll down to paste the source download link in the box and tap on GO. 3. Your Download will Start Immediately, Now you can start downloading any type of file with the data. What do you think about this? Don't forget to share with your friends on social media. Thanks for reading, thanks for Visiting.